This is exactly the kind of fantasy I love: a potentially epic setting but with “low fantasy” focus on the actual people within it. Peasants have the chance to determine fate for a change. Like Saladin Ahmed, I also want “fewer kings and starship captains, more coach drivers and space waitresses” in my spec fic. Beyond class diversity, the spec fic genre also needs progress in racial diversity. It’s something I try to do in my own writing and also something I consciously keep an eye out for in my reading. I was pleasantly surprised to discover the paladin in The River Kings’ Road, Sir Kelland, is from the African-analogue of this fictional universe. Although an orphan raised by Sun Knights, he connects with his heritage by braiding his hair in the fashion of its warriors, and the common folk view his dark skin as a manifestation of the Sun Goddess’ favor, making him the “Burnt Knight.” He’s also the subject of a wants-to-be-but-bound-to-celibacy romantic subplot with his assistant, a woman warrior, and I was happy to see that these two will have a bigger part in the sequel. I hasten to add that the story itself is less of an essay on class and racial diversity than the paragraphs I’ve written here–I was just impressed at how, while not groundbreaking, this story is able to quietly model that sort of diversity with a cast of well-rounded characters, albeit in a fairly standard fantasy setting. 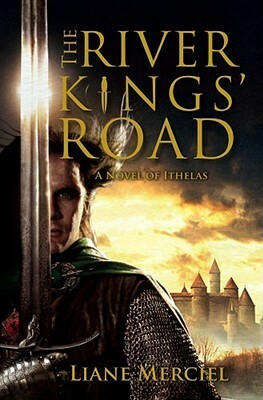 Although there are some unique and flavorful additions–the sadomasochistic Thorn witches (and that’s sadomasochism in the not fun, safe, sane, and consensual manner), Sir Kelland and his background, and even the River Kings’ gleaming Road itself–ultimately the setting is a medieval world, complete with analogues to the Vikings. One nice thing is that it’s a medieval world written by an author who clearly did historical research: there’s a throwaway line about a family losing its milk cow when their house is burned down, because during winter they keep the livestock indoors with them. Again, there’s these down-to-earth details of daily lives and what it’s like to be an average person in this world. I hasten to add that these are throwaway lines; the main plot isn’t bogged down by trivia. Which isn’t exactly to say doesn’t get bogged down. The plot starts with a bang–technically, with fire and Bloodmist, which is exactly what it sounds like–and the story moves forward steadily, without any wasted scenes. Yet, in the middle particularly, there are a lot of flashbacks to provide background information that rarely rises above standard fantasy fare. Wars, evil wizards, hard-bitten mercenaries, strange curses, and those Viking analogues I mention call the undead they fight Skraelings, which is an actual Viking term (meaning “wretch,” and applied by them to Native Americans. Specifically the Native Americans who drove them out of Newfoundland. I highly doubt Merciel intends anything racially loaded by the term; that’s just interesting trivia I want to bog my review down with). In contrast to my parenthetical comment above, the characters’ flashbacks are generally germane, and frequently help to develop the backstory and personality of individuals. Sometimes I wonder whether the background information could be more gracefully presented, but on the whole it is a fast-paced story as the worldbuilding gets fleshed out. All the same, aspects of the world still feel a bit thrown together–the Thorn Witches, despite some genuinely creepy body modifications, are in many ways a generic evil sorcerers empire to the east with exotic naming conventions, while the Western European main setting has a mixture of names that feel English and French–which makes parts of it feel more constructed than inhabited. Ang’arta especially–I do not know how that country works, and it does not feel like a real place. To be fair, none of the characters have actually been there yet, mostly because in true evil empire fashion it’s a place few people go to and survive. Even if the evil empire which never appears onscreen could be better realized (and when you put it like that, it’s obvious), the villainous characters themselves are as well-rounded as the good guys. There does seem to be more character development on their part, with redemptive arcs or at least tragic ones. In fact, I wound up feeling more sympathy for the most decent of the villains than the most antiheroic of the heroes–and I think that’s a feature, not a bug. There are enough genuinely kind people for me to care about and root for, like the peasant mother Odosse and Sir Kelland, who are respectively trying to survive and keep two babes in arms alive while fleeing a Thorn Witch through border territory that might at any moment erupt into war, and launching an investigation into a massacre that might wind up triggering said war. Unlike the typical epic fantasy where we’re supposed to be cheered at the prospect of a nice war to get the heart pounding and the lungs inflated, here war is shown as terrible as it generally is when you’re, say, one of the people who might drop dead when the Bloodmist is unleashed. Of a fairly large cast, one of the least interesting characters happens to be the one we start off with–Brys Tarnell, the brilliantly green-eyed swordsman featured on the cover, and pretty much a standard antihero. I actually expected more character development from him than I got. He’s a perfectly well-rounded standard antihero, with the street smarts to get Odosse and two babies across enemy territory and the occasional sarcastic barb, but he hasn’t hit the full swing of his redemptive arc yet (some might find this refreshing). Odosse, though, is instantly sympathetic without being nothing but a victim, despite being a peasant, a young unmarried mother, and unattractive in more than the “Hollywood Homely” sense. She has to make her own choices in this novel, some of them surprising. The Thorn Witch and her magic, which relies largely on mutilation, is genuinely terrifying, and while I wish we learned more about her motives, it looks like those will come up in the sequel. All of the backstory dropping and the slow character arcs appear to be in preparation for a much larger story arc–and this book is clearly the first in the series, with much tantalizingly unresolved at the end. I’ve already ordered the next, Heaven’s Needle. The Sun Knights would probably approve of you buying a used copy from Better World Books to raise money for literacy programs.